ACURA NSX BREAKS COVER: PEBBLE BEACH! The cover comes off the NSX Concept on August 18 at the Pebble Beach Concours. Acura ties the showing of its NSX Concept to the announcement of the Acura brand as an Official Sponsor of the 2013 Pebble Beach Concours d’Elegance. Engineers at Honda R&D Americas, Inc., Raymond, OH are leading global development of a production model based on the Acura NSX Concept. The next-generation Acura sports car will be produced in nearby Marysville at the newly established state-of-the-art Performance Manufacturing Center now under construction. The NSX is slated to go on sale in 2015. 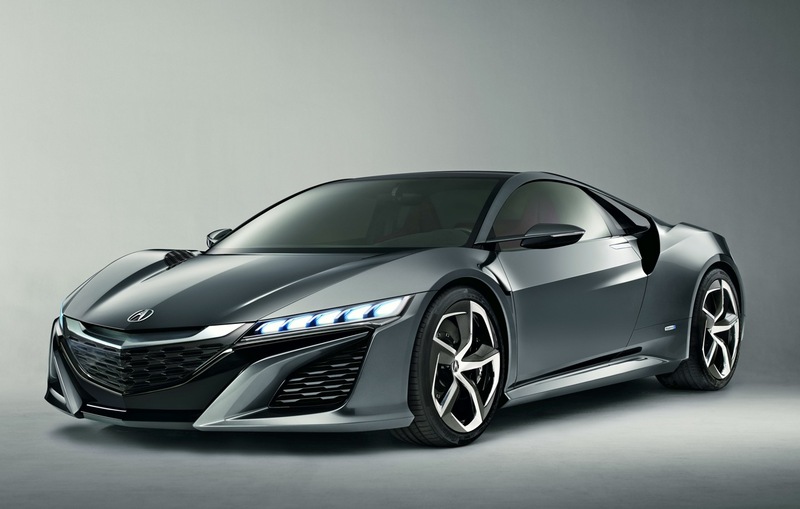 Targeting next-generation supercar dynamic capabilities with advanced environmental performance, Acura announced in 2012 that the NSX will be powered by a mid-mounted, direct-injected V-6 mated to Acura’s Sport Hybrid SH-AWD® Super Handling All-Wheel Drive. Acura’s Sport Hybrid SH-AWD® is an all-new, three-motor high-performance hybrid system that combines torque vectoring all-wheel-drive with advanced hybrid efficiency through the use of three electric motors. One motor is integrated with the V-6 engine and its all-new dual-clutch transmission (DCT) driving the rear wheels, and two motors driving the front wheels. The system enables instant delivery of negative or positive torque to the front wheels during cornering to achieve a new level of driving performance unparalleled by current AWD systems. On August 4, a testing prototype version of the NSX lapped the Mid-Ohio Sports Car Course in Lexington, OH prior to the running of the Honda Indy 200 race. It showcased the steady progress being made toward the launch of Acura’s next-generation, mid-engine supercar. The Acura NSX Prototype, above, Mike Matune photo, lapped the 2.4-mile winding road course, driven by a member of the engineering development team. The NSX Prototype featured custom blue graphics that speak to Acura’s intention to go racing with the new NSX. The NSX Prototype shares the same basic styling as the NSX Concept that will be on display at Pebble Beach.